Everyone is welcome to attend our church and participate fully in the many activities that are found here. Engage at your own pace. After attending services and church events for a while, you may make the decision to become a voting member. Any person may become a Member of this Church who is in sympathy with its purposes and programs, and who is at least sixteen (16) years of age. Attend one of our “All-Comers” gatherings held throughout the year. 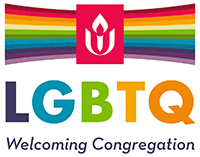 An All-Comers gathering is a great step towards membership as well as a way to familiarize yourself with Unitarian Universalism in general and this church in particular. The gathering is in three parts. First, we get to know each other by sharing our individual spiritual paths; we are often surprised by how similar our “unique” journeys are. Next, we delve into some UU history; where we find our theological roots reach back to the 3rd century. Lastly, we talk about this particular church; all that we offer and all that we require of members. Sign the Membership book. You can sign the Membership book before or after a Sunday service in the presence of the Minister or a member of the Board. You will then be invited to take part in a short welcoming ceremony at an upcoming Sunday service. We enjoy having the opportunity to officially welcome our new fellow members. Pledge Financial Support. A pledge is a member’s promise of financial support to this religious community. Our members’ pledges allow us to estimate income so we can prepare a budget to operate the church. Becoming a member of this church and making a pledge of support is saying “I am more than a guest. I am vested in the future of this church.” A pledge card will be included with other new member information you will receive when you sign the membership book. Get Involved. Being a part of our church community provides an opportunity to explore and share your personal gifts. There are many people who can help you find activities that fit your interests and meet your needs. Regular attendance at Sunday service is one of the best ways to learn what’s going on and become familiar with the many people that make up our congregation. Participating in an Adult Religious Exploration class or joining any of our Small Group Ministries are ways to explore spiritual matters and begin building relationships with others at the church. And as you can see as you explore the other sections of this website, there are many Committees and Affinity Groups that are always interested in welcoming new talent and hearing new ideas. You may maintain your membership by keeping the office informed of your current address, continuing your pledge contributions, and renewing your pledge annually. If you decide to discontinue your membership, we ask that you contact the church office to formally withdraw your name from the membership roster.